In this video, you will learn how to do a reflection over the line y=x. The line y=x, when graphed on a graphing calculator, would appear as a straight line cutting through the origin with a slope of 1. 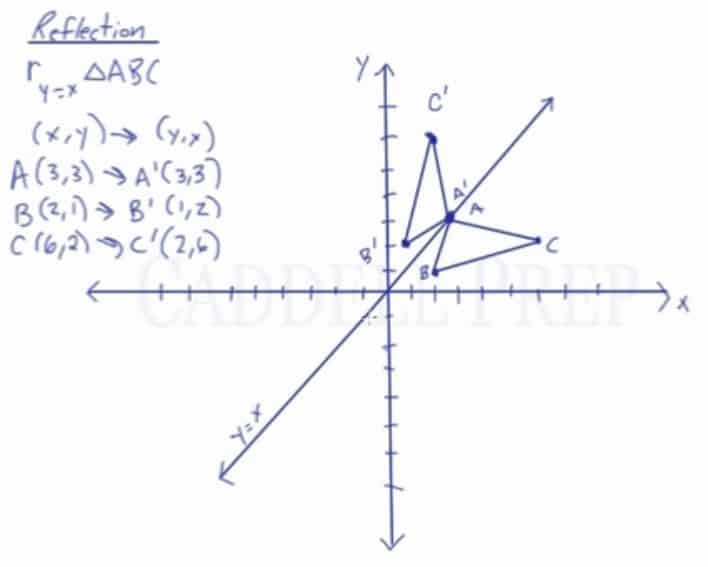 For triangle ABC with coordinate points A(3,3), B(2,1), and C(6,2), apply a reflection over the line y=x. By following the notation, we would swap the x-value and the y-value. In this lesson, we’ll take a look at reflecting over a line . First of all, what is a line ? This is a line that for every value, we get the same value. will look something like this. A diagonal straight line. When , . When , . And when , . And so on. If we have a point, for example, , we’re going to reflect it over. We need to move perpendicular to it. One side should be perpendicular to the other side. Our image now is . All we did was switch the and the values. For example, if the initial image is . We have to make a line perpendicular to measure the distance. Then make the same line distance on to the other side. The reflected point is . When we reflect over the line , we just switch the values of and . Let’s look at an example where we’ll reflect triangle ABC over the line using the coordinates. We know that the rule is the coordinates is going to switch to . We’ll simply switch them. Let’s graph this now. And draw a triangle. Now, we have a reflection of triangle over the line to form the image of .